Every community deserves to have a central Downtown place where people come to connect, communicate, and celebrate. Downtown is the social heartbeat of a community where social and economic exchanges take place, celebrations are held, friends run into each other, and cultures mix. Want to see how a Downtown gets built? Check out our videos chronicling the completion of Downtown's main street, "Capitol Avenue - Connect, Communicate and Celebrate," and then see how it all started with "Capitol Avenue - Building the Backbone of Downtown Fremont!" Fremont Street Eats - Check out Fremont Street Eats on Capitol Avenue weekly every Friday from May through October. Produced by the Fremont Chamber of Commerce and Food Truck Mafia, this event hosts multiple food trucks offering a diverse mix of culinary treats. Burger and Brew Fest - Featuring delicious brews and tasty foods, the Fremont Burger and Brew Fest was held on May 26 from 11 a.m.-5 p.m. on Capitol Avenue between Paseo Padre Parkway and Liberty Street. As one of the Bay Area’s most delicious events, the event features Bay Area craft breweries, an assortment of wines, burgers, and sliders from local food vendors, restaurants, and live entertainment. Fremont 4th of July Parade - Stop by annually to watch the star-spangled excitement of creative floats, specialty units, marching musical bands and guest celebrities! The Fremont Festival of the Arts - The Fremont Festival of the Arts celebrated 34 years of fun in the sun! It is the largest free street festival west of the Mississippi River and is held the first weekend of August. Festival of India and Parade - The Festival of India and Parade celebrated 25 years! The Festival of India and Parade traditionally is held the third weekend of August. Downtown Date Night- This fun event held in September features Fremont Street Eats, complete with gourmet food trucks, and an outdoor movie on the big screen. Enjoy a night under the stars! Trick or Treat on Downtown Safety Street - A "spirited" Halloween event for adults and children alike! Join in on the festivities with Fremont Street Eats and the City's Recreation Services Division and enjoy this "spooktacular" event during the Halloween season. Downtown Fremont is definitely on the rise! An array of activity has taken place in the Downtown over the past year, including demolition of the former Town Fair Shopping Center buildings in preparation of the future Downtown community center. While the demolition is complete, construction for the Downtown community center is not anticipated to begin until 2019. Therefore, in an effort to continue contributing towards an active and vibrant Downtown for our community, the Town Fair site will be transformed into a temporary plaza. 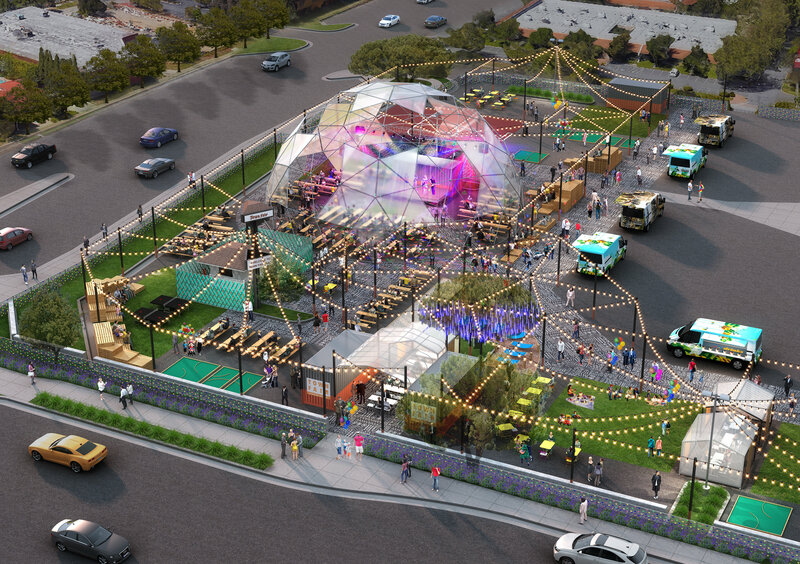 Placemaking curators Public Space Authority (PSA) will work with the City to program the temporary plaza with daily activities including: food trucks, outdoor games, public art, music, a beer garden, maker space, and regularly scheduled community events. The temporary plaza will open later this spring and pilot concepts that can later be integrated into the permanent plaza designed for the new Downtown community center. View the conceptual drawing. Throughout 2018, PSA will continue to seek community feedback on the programming and design of the temporary space and will work to respond to and incorporate as many ideas as possible. Share your thoughts at townfairplaza.com. If you have any questions regarding the programming of the new temporary plaza, please contact Anna Guiles with the City of Fremont at 510-284-4015 or by email. Turning Point at State Street Park - The art installation Turning Point is integrated within State Street Park, Downtown Fremont's first public park, located at Paragon Apartments, 3700 Beacon Avenue. Turning Point consists of several inviting granite seating groups and three large-scale stainless steel sculptural elements that combine to create a welcoming environment, and provide the plaza with a unique sense of place. The artist, Richard Deutsch, worked closely with the Paragon developer and city planners to develop a vision for the plaza in keeping with the modern, urban future of Fremont while at the same time referencing the several ethnic groups that compose the community today. Downtown Fremont recently welcomed a new visitor — Space Glow! Space Glow will be on display at the corner of Capitol Avenue and Fremont Boulevard from May 2017 through May 2019. Space Glow is part of the Downtown Fremont Rotational Public Art program, which is intended to contribute to the vitality of the Downtown by displaying exciting artwork for a two-year rotating basis. The Downtown Fremont Rotational Public Art Program is financed through private development fees and showcases various artwork in an effort to support the arts and create a sense of identity for the areas in which they’re installed. The first Downtown installation, ‘Heartfullness,’ was a sculpture by artist Katy Boynton and was on display from September 2015 through January 2017. Phase 1 of the Civic Center Master Plan Project, a new 13,400-square-foot downtown community center and 1-acre civic center plaza, is anticipated to break ground in Summer 2019. The project will facilitate the programming needs of Fremont’s diverse and creative community. Anchoring the corner of Capitol Avenue and State Street—downtown’s heart—it will become the center of community activity and serve as a new destination for traditional community center functions such as community meetings, receptions, local business events, and economic development conferences. The design features a grass space at the center of the site which will provide unique flexibility for programming of community events and activities, including active games/sports, food trucks, concerts, maker fairs, markets, and more. For questions about Phase 1 of the Civic Center Master Plan Project, contact Clifford Nguyen with the City of Fremont at 510-284-4017. Want to Learn More about the Downtown? Where is the Downtown located? Downtown is 110-acres anchored by Fremont City Hall and within walking distance to the Fremont BART Station. It is located north of Fremont Boulevard, south of Paseo Padre Parkway, west of Mowry Avenue, and east of Walnut Avenue. View the map. How are we working to enhance the Downtown? The Downtown Community Plan is the blueprint that will guide our work. This provides the development community with the direction and certainty that they need to invest in our community while preserving the goals and vision the community has for the Downtown. Check out our slideshow to get a flavor of what we envision for the Downtown. Or view a 360 degree 3D projection of the State Street and Capitol Avenue intersection, featuring our new Civic Center and mixed use retail. Locale @ State Street - 157 residential units with 21,000 square feet of ground floor retail located on the corner of State Street and Capitol Avenue. This development will include 14 buildings in which three, Buildings A, B, and Building 12, are currently under construction. Buildings A and B are residential buildings with parking structures and ground floor commercial space. Anticipated completion dates for Building A is fall 2018 and winter 2019 for Building B. View the site plan. 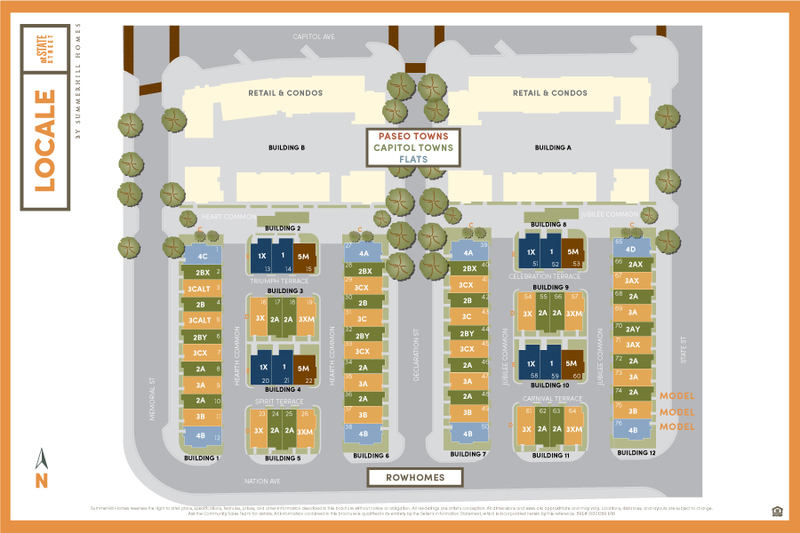 Capitol Villas - 13,400 square feet of ground floor commercial space and 44 residential units located on the corner of Capitol Avenue and Hastings Street. Public and residential parking will be provided by 75 parking spaces in the basement and ground floor garages. The project is currently going through the building permit review process, and permits to construct it are expected to be issued spring 2018. Anticipated completion date is fall 2019. Progress continues on Capitol Avenue improvements making Downtown more walkable and bikeable to and from the Fremont BART Station. Phase III is scheduled to begin construction in spring 2018 and will enhance connections from Capitol Avenue across Paseo Padre Parkway and through the Gateway Plaza shopping center to the BART station. Enhancements include: decorative pedestrian lighting, raised green buffered bike lanes, a protected intersection at BART Way and Civic Center Drive, new crosswalks, parking spaces, and Americans with Disabilities Act (ADA) regulation ramps. Way-finding signs to help pedestrians and bicyclists find their way around will be strategically placed from the Fremont BART Station to Paseo Padre Parkway. Anticipated completion date is winter 2018. Planning is also underway for the construction of Phase 1 of the Civic Center Master Plan, which will include a new community center and urban plaza. These amenities will provide indoor and outdoor space for the community to gather, connect, and celebrate. Construction is anticipated to start in 2019. The City's Urban Initiatives Manager collaborates with key City staff, and external partners such as service clubs, the Fremont Chamber of Commerce, neighborhood organizations, arts and cultural organizations, and educational institutions to help the Downtown continue to thrive. Sign up to receive notifications about the Downtown District.